I absolutely adore the 12 Tags of Christmas with a Feminine Twist over at Ellen Hutson’s Classroom. Each and every tag is wonderful in it’s own beautiful way. The designers have really outdone themselves this year. Hopefully time will permit me to get a few more done. This particular tag is based on Sharon Harnist’s gorgeous Day One tag. Step two: ink the inside top portion of the embossing folder with clear embossing ink (that’s the side that will be embossing the top of your tag). Run through your die machine and quickly sprinkle white embossing powder over the entire tag. Brush the embossing powder off of the tops of all the snowflakes and in random areas of the tag. Heat emboss. Sand the edges of the snowflakes, in random fashion. 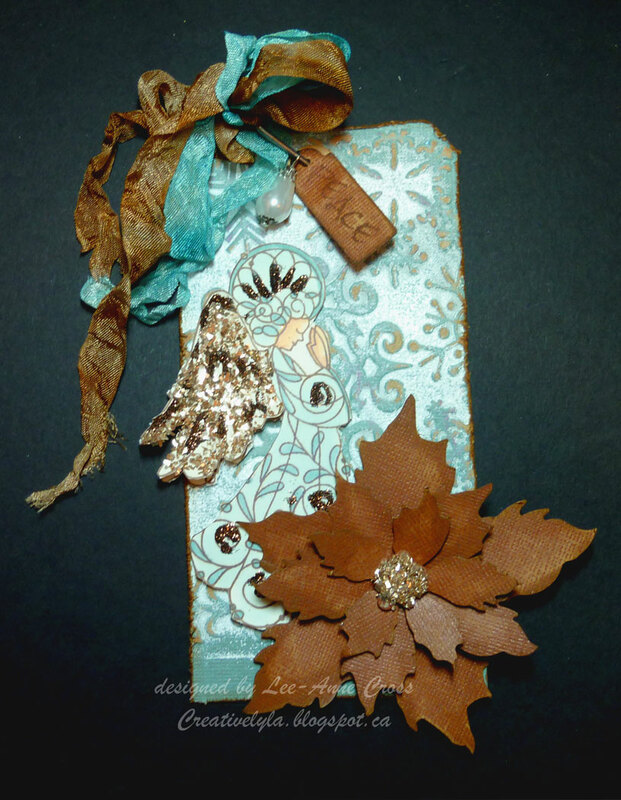 Use a distressing tool to distress all the edges of the tag. (side note: as you can see the embossing folder is not as long as the tag and therefore leaves a solid border at the bottom) I like this look but you could cut it off. Ink all the distressed edges with Brushed Corduroy Distress Ink. Step three: stamp in angel on ivory card stock and stamp the wings again. I’ve used Gina K. Pure Luxury heavy weight because I was coloring with Copics. Color very loosely with your Copics. Next using the glue of your choice, highlight areas where you want to add glitter and glitter away! The second set of wings wasn’t colored…just added glue and two different colors of glitter. Then fussy cut the angel and second set of wings. Pop the wings up on dimensionals and add the angel to the tag. Step four: using the Tim Holtz Tattered Poinsettia die make the poinsettia out of the tan color of the same Kraft Core paper, sand the edges and then ink the edges in Brushed Corduroy Distress Ink. Add the same glitter to the poinsettia center die cut. Adhere to the tag. Step five: using your Distress Inks, color two pieces of seam binding, spritz with water, scrunch in your hand and then dry carefully with a heat gun. Step six: cut the little tag with Tim Holtz Tiny Tabs and Tags die and stamp with sentiment. Using a Tim Holtz Swivel Clasp…add seam binding, pearl and tiny tag. With any luck I’ll find some time to do some more of these tags! Thanks for being with me today! Love those wonderful angel wings. This is truly amazing! Your Angel is beautiful, and her wings are as well. Love your colors and all the fun details – gorgeous! This is BEAUTIFUL, Lee-Anne!! Love the colors you've used, and I'm over the moon for the details – that little pearl charm along with the tiny tag, the glittery angel wings, and all that wonderful, yummy seam binding. I could look at this tag all day long. TFS! !